These easy closet organization ideas will help organize even the tiniest of closets! If you are a long time reader here, then you know we live in a smaller sized home. We have always believed that bigger isn’t necessarily better, and we love our space for the most part. The only problem we run into with our small home is storage space. We really have to maximize storage in every single room. Sometimes that means having less stuff, and sometimes that just means coming up with creative ways to make things organized. Today, I’m sharing some simple and inexpensive closet organizing tips over at the Deals Plus blog, and I’d love for you to check them out! 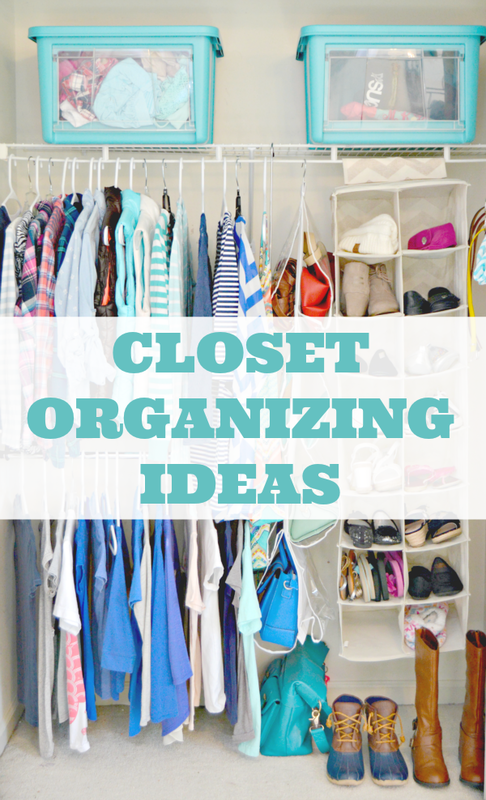 I’m so excited to share these ideas with you, so hop on over to Deals Plus to see my Easy Closet Organization Ideas HERE! Also, coming soon…I’ll be revealing our daughter’s new bedroom design packed with tons of hidden storage. To say that it turned out beautifully is an understatement! It’s the perfect space for a teenage girl to hang out with her friends! I’m also working on tons of new homemade cleaning solutions with printable labels and some great pantry storage ideas and will have some free printable pantry labels too! Big things are getting ready to happen here in 2016 and I’m so happy you are here to share them with! Stay tuned! You can check out tons more cleaning tips, organization ideas, home remedies and more on my Home Tips Page HERE too! Love those closet organizing tips!! Thanks!! Do you happen to know where those beautiful turquoise storage totes with the windows in them came from? Having a see through window in a storage box is such a great idea! !